We were sitting in a determinedly retro booth in Times Square’s kitschy Stardust Diner, practically yelling at each other over waitstaff singing show tunes. Tripp, across from me, smiled in a cheerful bright-teal jacket. “We call Valerie American Girl royalty,” a company rep had informed me. Tripp was explaining the fierce connection between girls and her characters, which she didn’t really need to explain to me, because—like so many women in my demo—an American Girl book was probably my first independent chapter book, too. “It’s sort of universal and intimate at the same time,” Tripp added. The Pleasant Company had invited me to the launch of Maryellen Larkin, their latest addition to their historical line—now called “BeForever.” Like Tripp herself (who wrote the new books), she’s a child of the 1950s. The company had scattered Maryellen’s various “sets” around the mezzanine and invited several parent-child pairs to come see. A reporter from PIX11 periodically hoisted a Maryellen doll into the air for a live shot, while families ate complimentary pancake breakfasts. 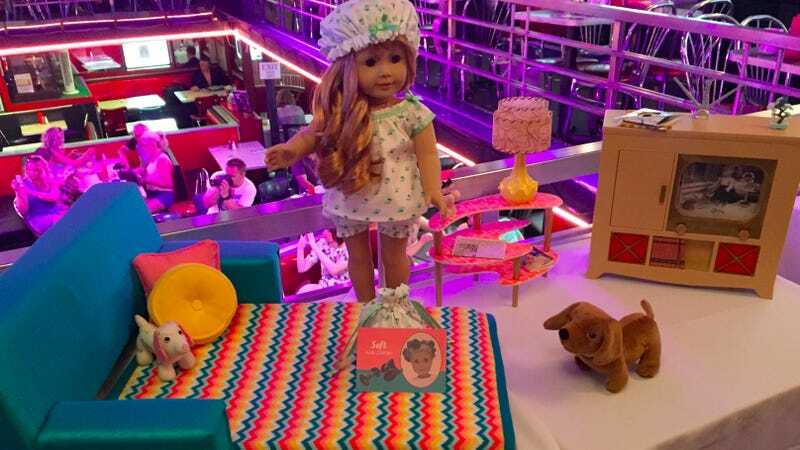 Each table had been equipped with purpose-built American Girl doll seats. Apologies, however, if you think that your personality can be wholly defined by your allegiance to a particular American Girl historical character. “We are none of us one thing all the time. Sometimes you want to be the impulsive Felicity. And then sometimes—Maryellen is just sort of goodnatured and exuberant and ebullient. And then other times you’re Samantha, very thoughtful. But none of us can be thoughtful all the time!” said Tripp. “Girly” accessories, however, are undeniably a crucial element of the American Girl appeal. This fall, for instance, the company is teaming up with William Sonoma to sell branded bakeware (in child and adult sizes, of course). I watched girl after girl pause before Maryellen’s vignettes—for instance, a diner in bright colors and a midcentury foldout couch/TV combo, all so period-perfect they must’ve been designed with nostalgic, wallet-wielding mothers and grandmothers in mind—stopping to stare, then run her little hands over doll hair and doll dresses and doll accessories. But, it’s probably a willingness to walk the line between girly-ness and a dedication to recognizing girls as independent actors who aren’t defined by their girly-ness that’s traditionally made the company truly beloved. Think of Molly’s summertime adventure, which culminates in the character using what she knows about D-Day for her camp’s cutthroat game of capture the flag. Think of The Care and Keeping of You, the company’s frank guide to puberty. Compare an American Girl store at its most terrifying to Disney’s princesses, who—until Frozen, anyway—have always come equipped with a prince. Of course, the company looks very different these days. Spokesperson Julie Parks pointed to the recent revamp, which retooled the packaging and presentation for today’s customer, and insisted that, “We consider BeForever and the historical line core to everything we do. It is incredibly important to us.” But if you haven’t paged through a catalog since your tween years, it might be a little jarring. Molly and Felicity are gone, for instance, as of 2014 and 2011 respectively, and your average kid is more likely to plead for a lookalike “TrulyMe” doll or a Girl of the Year.